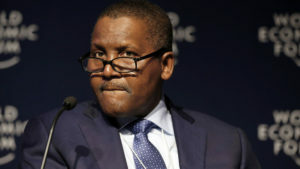 Aliko Dangote, Africa’s richest man, founder and chair of the continent’s largest cement producing company, has signed a $650 million loan facility with the African Export-Import Bank for his oil refinery project in Nigeria. According to a report by the News Agency of Nigeria, the loan signing ceremony took place on Saturday in Abuja during the annual general meeting of the Afreximbank. Despite being Africa’s biggest crude producer and an OPEC member, the West African nation ships in almost all its gasoline and diesel from abroad because of the decrepit state of its government-owned refineries. The seven-year term loan would attract a moratorium of five years, according to facility terms read out during the signing ceremony. According to Devakumar Edwin, Executive Director of the Dangote Group, who represented Aliko Dangote at the signing ceremony, the oil refinery would cost around $10 billion and should be completed by December 2019. The Dangote Group has concluded plans to borrow $3.3 billion for the project, via a loan facility syndicated by Standard Chartered Bank. The rest will be funded by equity and through export agencies such as Afreximbank. Aliko Dangote built his fortune on cement and now has interests in flour milling, agriculture and real estate. Posted by Khalid Al Mouahidi on July 17, 2018. Filed under Business. You can follow any responses to this entry through the RSS 2.0. Both comments and pings are currently closed.